Nick Barnes is back, setting off a chain of events that uncovers a conspiracy beyond moral comprehension against Earth’s entire population. The scheme has taken generations to develop and it’s on the cusp of being fully implemented. Agrochemical and pharmaceutical industrialist Dr. Hendrick Schmidt and media baron Davis Lovemark lead the scheme with the unerring belief that they are the stewards of humanity and that they alone have the right to decide the fate of the masses. A ruthless international cartel aims to control the world’s food supply and destroy anyone who gets in their way in this latest action-packed– OMG! this could really happen–global thriller from the author of award-winning Dark Seed. Author Lawrence Verigin returns with his memorable cast of characters in this sequel in his enthralling thriller/suspense series that focuses on GMOs (genetically modified foods) and the international companies that control their ever-increasing impact on the world’s food supply. When affable investigative reporter Nick Barnes responds to an urgent request from one of his old colleagues, Summer Perkins, and sets out to meet her in a rundown San Francisco dive bar, he doesn’t expect to find her murdered corpse waiting for him in a darkened booth. With his investigative instincts kicking in hard, Nick returns home and starts making calls trying to discover what story Summer might have been working on that could have gotten her killed. In short order, Nick’s curiosity puts him squarely in the sights of the ruthless industrialist cartel. His life—along with that of several of his colleagues—is now threatened. Meanwhile, the local cop who is in charge of the investigation into Summer’s murder seems to be getting nowhere fast. At the urging of his friends, Nick goes into hiding. A wealthy Texas businessman, who has had past personal ties to the cartel and has seen the error of his ways, comes to his aid. The suspense builds as Nick and his cohorts are chased from one safe house to the next as they try to stay one step ahead of the cartel’s ruthless killers while they frantically work to uncover the scientific evidence they will need to expose the environmental carnage and famine that the genetically modified seeds will wreak upon the world’s population. 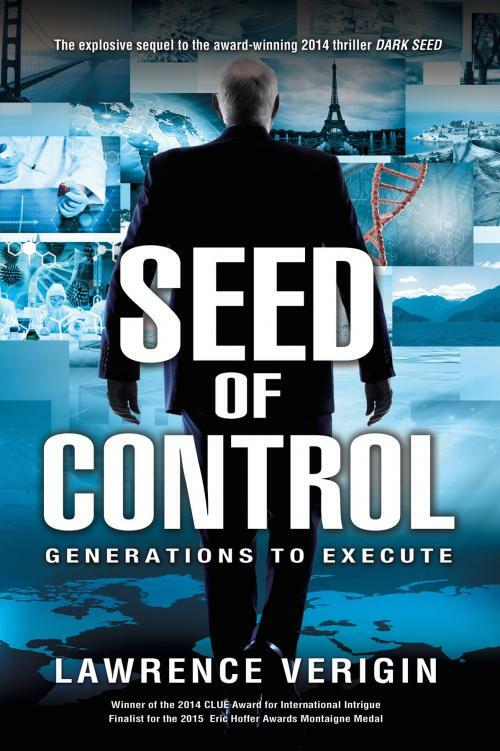 Extensively researched, Seed of Control is an engrossing suspense thriller that comes with a timely warning about the possibly devastating effects genetically modified plants can have on the world’s fragile environment. The work is a powerful warning about the perils of allowing a few monolithic corporations to control the world’s supply of seeds, their only motive being profit rather than the health and survival of third and fourth-world at-risk populations. As the powerful cartel raises the stakes with their unlimited resources and ruthlessness, Nick becomes more determined than ever to expose their secret agenda and their means of implementing it. Verigin’s Seed of Control global-thriller is about a conspiracy plan of unimaginable destruction. This riveting and timely novel brims with international intrigue and surprising plot twists. Highly recommended. Seed of Control (Thriller) is the daring sequel to novel Dark Seed, by Author Lawrence Verigin. Verigin explores socially important themes, the main one here being Genetic Engineering in food and its impact on the wider world. The main part of the story is narrated by Writer Nick Barnes, an intelligent young man living in San Francisco. The story is set in the early 2000s, just five months after the events of 9/11. Already, this sets the tone for the novel, hinting at conspiracies and further disasters to come. With many close shaves, fast cars, and gunfights, this is certainly a tale that lives up to its genre. The main theme I got from reading the novel was to ‘Keep your friends close and your enemies closer.’ When reading through the novel, you are never sure of who Nick can trust. The characters, while witty, lacked personality in my opinion. They were charming, but didn’t feel as real as characters from other books that I’ve read. Nick Barnes receives a call from an old colleague, Summer Perkins. But when he meets her, he finds that she has been murdered. Nick looks into what she was reporting on and finds Naintosa, a company known for genetically engineering crops. But they don’t really have humanities best interest in mind. Nick goes on the run to try and stay one step ahead of the killers hired by Naintosa. Will he survive long enough to get the conspiracy out to the public? This is a great, action filled thrill ride. Nick is trying to start over when he gets a call and can’t help but step up and help but this makes him a target. The minute Nick seems to get ahead and continue investigating, he finds himself in the cross-hairs once again. The really scary thing is hoe this could easily happen in real life? This book is for you. Just so you know, it is the second book in the series. I didn’t have a hard time figuring out what was happening but I will definitely be checking out Dark Seed. \If you are looking for a great thriller/mystery with lots of actions, explosions, a greed corporation, and a great conspiracy theory, look no further. I received Seed of Control from Sage’s Blog Tours for free. This has in no way influenced my opinion of this book. 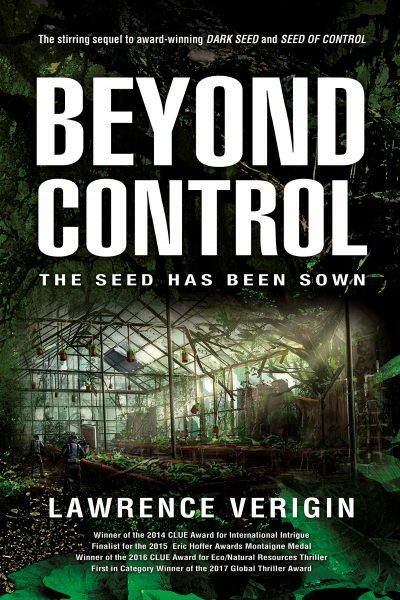 Seed of Control by Lawrence Verigin is a fast paced, ecological thriller about the journalist Nick Barnes as he attempts to uncover and foil the attempt of the agrochemical and pharmaceutical conglomerates Naintosa and Pharmalin in controlling the world. It is the awaited sequel to the book Dark Seed, about the implications of genetically modified foods. From GMO’s it moves towards exploring the effects of the herbicide glyphosate. It further explores the idea of genetic manipulation and DNA damage and its deleterious effects on human health. Seed of Control is well written. The dialogue between the characters is superb. The character development is revealing. The plot alternates between action, suspense and mystery. There are turns and twists as Nick moves forward in uncovering and revealing the plans of this corrupt organization and its evil henchmen. From a quick beginning it flows quickly into intrigue and wanting to know what happens next. It was hard to put down once started. An excellent book!!! I really enjoyed the first book, Dark Seed, so was looking forward to the sequel, Seed of Control. If you haven’t read Dark Seed yet, I recommend that you read it first before Seed of Control. In the first book, the author does a great job of building reader interest in the main characters, and so much so that you will find yourself cheering them on as they battle a gigantic, multi-national corporate foe. The battle itself is plausible and entertaining as it continues in various locations throughout the Pacific Northwest, and makes you start to wonder what exactly is in the food you put in your mouth daily. In Seed of Control, new characters are introduced to heighten the battle between good and evil, and the author doesn’t disappoint. The conflicts are tense and chases are fast paced, and again you’ll find yourself cheering on the underdogs as they continue against all odds to outwit and outrun their enemies. There are some unexpected events that happen towards the end of the book, which sets the stage for another exciting sequel that I look forward to reading. Lawrence Verigin has done it again! He has written another ecothriller that is full of brilliance and suspense. 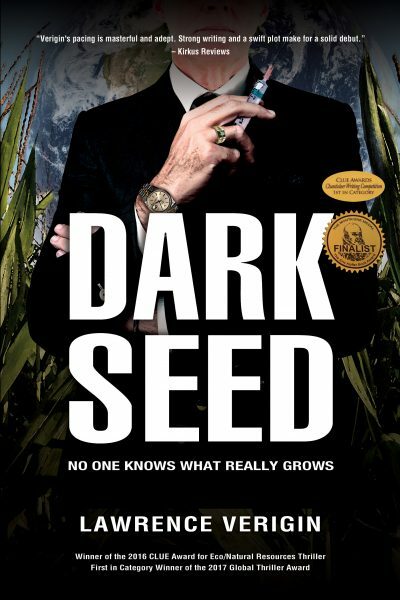 Seed of Control is the follow-up book to Verigin’s last release, Dark Seed. I am confident it can be read as a stand-alone novel, but if you can, take the time to read Dark Seed as well because it’s great. Protagonist Nick Barnes is an ex-journalist who is attempting to rebuild his life after a nightmare situation involving a greedy corporation who would be pleased to see him six feet under. He seems to be getting back on his feet and working on his novel, but the past comes knocking on his door. Well, not knocking, more like lock-picking and shooting. Seed of Control is a fast-paced thriller about something affecting our world today: GMOs and the rich covering up their deadly plans to rule the world. It’s emotional, exciting, and the ending has you slamming your fist down on the table because you don’t want to wait for book three. But, you will. Seed of Control is one of those books that keeps you turning page after page well past your bed time. This book is not only a compelling thriller but a thought provoking read that keeps you wondering if there just might be some truth behind the fiction. If you haven’t read the prequel Dark Seed, I highly recommend you do. You will not be disappointed and will soon find yourself back here looking for more in Seed of Control. Seed of Control was fast paced and exciting. The locations the book was set in were interesting and the descriptions made you feel as if you were right there. The scheme that was uncovered was extreme, but when you thought about it, plausible, the way the author revealed it. A great read, I highly recommend it.